Our experience, trained staff has a combined total of more than 80 years selling diamond engagement jewelry. This translates into a real understanding of the variety of choices available in wedding jewelry today. We understand the needs of our customers. We realize that every customer is unique, and as such, needs diamond jewelry that will suit their tastes, lifestyle, and budget. Strauss understands the 4 Cs for evaluating diamonds: cut, color, clarity, and carat weight. Perhaps most importantly, we understand how to grade the cut of a diamond and we evaluate our stones on this important, but sometimes overlooked quality. Cut is the single most important indicator of a truly beautiful stone. 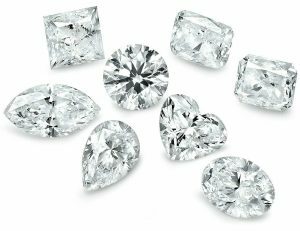 As American Gem Society (AGS) members, we have precise standards for evaluating diamonds, commonly known as the 4 Cs: Cut, Color, Clarity, and Carat Weight. The American Gem Society Diamond Grading Standards evaluate three of the four value factors — cut, color, and clarity — on its own 1–10 scale. The scales begin at 0 (zero), the highest grade, and go down to 10, the lowest. The three factors are expressed separately along with the fourth factor, the carat weight of the gemstone, for the final American Gem Society Grade. Clarity is the evaluation of a diamond’s internal and external characteristics. The fewer inclusions or blemishes, the more desirable the diamond. Inclusions are internal, that is, inside the diamond. Crystals are merely minerals trapped inside the diamond; feathers are breaks in the diamond. Blemishes are usually very small and are only on the surface of diamonds. To locate these tiny characteristics, an American Gem Society member jeweler will use a binocular microscope that magnifies the diamond ten times. Then, evaluating the size, location, nature, number, and color of all the inclusions and blemishes, a clarity grade from 0-10 is assigned. A truly colorless diamond is extremely rare. Most diamonds possess varying degrees of yellow or brown and small, subtle differences in color can make a substantial difference in value. If a diamond is well cut, the diamond’s refraction and dispersion often will disguise certain degrees of coloration. Unless a diamond is a fancy color (any color other than colorless to light yellow or brown), the American Gem Society Color Grading System places it on a 0 to 10 scale, 0 being colorless. To accurately and consistently grade color, an American Gem Society trained grader will utilize special lighting to compare the diamond being graded to a set of American Gem Society Master Color Comparison Diamonds, which have met exacting standards of cut, color, clarity, and carat weight. Of all the 4 Cs, cut has the greatest effect on a diamond’s beauty. In grading the cut, the cutter’s skill is evaluated in the fashioning of the diamond. Diamonds have a unique ability to manipulate light efficiently. This unique characteristic can be released and maximized only by cutting and polishing the diamond to an extremely high level of accuracy. The American Gem Society Cut Grading System considers not only the proportions of a diamond, but also the craftsmanship of its overall symmetry and polish. The system is unique in that it uses the latest in technology to analyze the cut’s impact on the diamond’s light performance. The standard used to measure diamond weight is the carat. A carat equals 1/5 of a gram (or 1/142 of an ounce). Each carat is further divided into points, each point representing 1/100th of a carat. While weight may be the least important of the four Cs in determining value, it may be the easiest of the four Cs to gauge accurately and is the most objective. As diamonds increase in size, their cost tends to increase geometrically. Thus, a one-carat diamond may cost more than twice as much as a one-half carat stone of equal quality. Also, as previously stated, weight does not always enhance the value of a diamond. In fact, when a stone is improperly cut, added weight may serve only to reduce its brilliance. For these reasons, you should consult with an American Gem Society titleholder or individual regarding the question of carat weight.